Though these things are not inherently bad, I know that I’ll be tempted to learn and perform and teach and disciple and serve and sacrifice with an aim to build my personal kingdom, amass worldly accolades, and earn a reputation for godly faithfulness. That is not Christian love; it is fleshly pride and selfish ambition, and it is arsenic to the human soul. 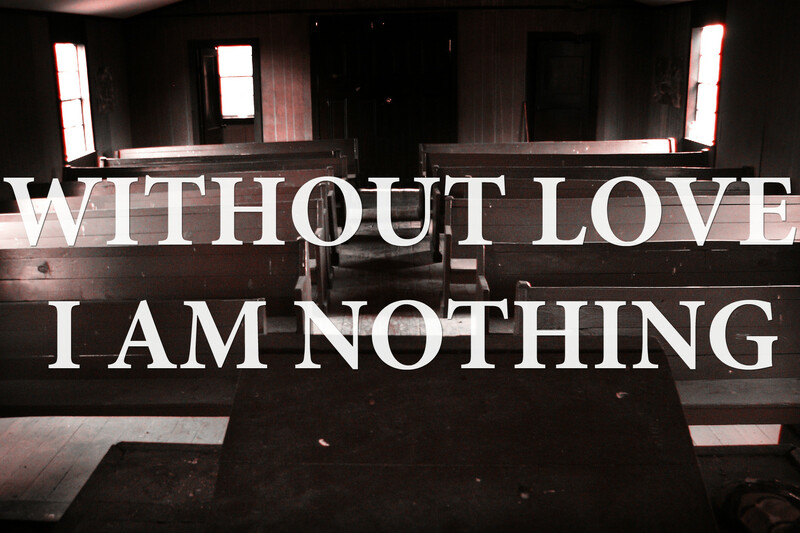 This eternal truth remains: without love, I am nothing. This means that the necessary root and proper motivation for all my gospel laboring is a deep, abiding love for God and for others. Every personal act of Christian service should draw its lifeblood from a heart pulsating with Christian love. Without this internal love, my external action, no matter how devout it appears, becomes a putrid stench in the nostrils of God. It is not difficult to impress men with intellect, theology, scholarship, sacrifice, dedication, eloquence, and discipline. Nevertheless, if I impress all men, but lack gospel love, my impressiveness is ultimately worthless. Such a facade of love-lacking impressiveness may earn its fleeting flash of glory from man, but in the end it’s nothing more than wood, hay, and straw, useful as kindling for divine fire. Dear Bible students, seminarians, pastors, scholars, biblical counselors, missionaries, ministry leaders, and disciple-makers, without love, we are nothing. Finally, do not despair if you sense that your love is small. Ryan Fullerton said if you have any genuine love at all it’s because of the gospel and because you are saved. Recognize and rejoice that we love because he first loved us through the saving work of Christ. Pray for greater love. Then, by God’s grace, strive to do all that you do because you love Jesus and you love people. I love this version! Applicable to anyone who wants to spread the Love of Christ! Great! And perfectly ended with the Edwards quote. That was so POWERFUL, brother!!!! !